Many people have studied the origins of these structures: the most famous is Charles Darwin (1809-1882), whose theory is still the most widely accepted and by now corroborated by geological and palaeontological surveys. To explain the origins of an atoll, for instance, there are at the onset a series of surf barriers surrounding the coasts of a volcanic island. Due to the movements of the earth’s crust the island slowly begins to sink, while the coral belt keeps growing. 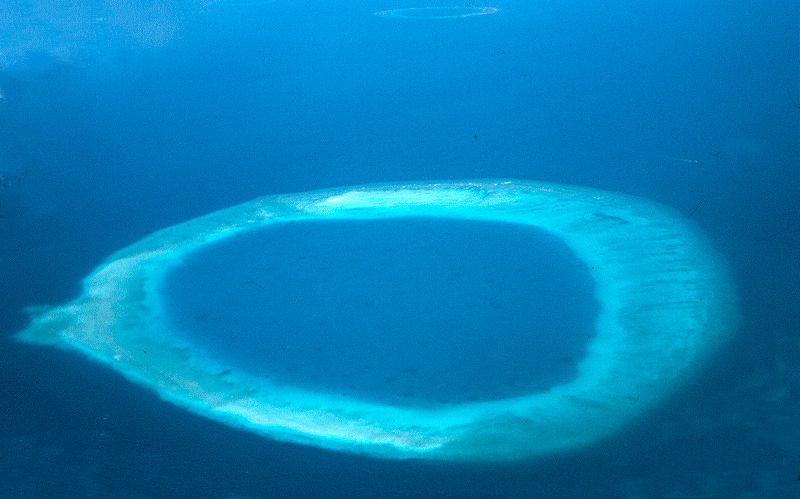 When the island has sunk down, the coral ring finishes surrounding the entire lagoon, leaving only some small canals with strong tidal currents that keep the atoll communicating with the open sea. The current, the waves, the tides and the growth of corals alter the part of the atoll rising out of the water, which can be a few metres above sea level, sometimes forming quite large islands.